As with any troubleshooting, there can be a couple of accomplishments. Using the flowchart may enable a technician to fix a simple situation that prevents the router from working properly. It may lead to a more detailed set of actions to diagnose and possibly resolve a more complicated problem. Or it may confirm that resolution requires a greater level of technical support. Cisco says that to benefit from the troubleshooting guide, “you must be experienced using Cisco IOS” and have “some responsibility for installing, configuring, or operating” their router. That’s not me, and I’m unqualified to discuss the technical accuracy of the Cisco troubleshooting guide. I’m featuring the flowchart here because it’s an effective use of the format, and because with the rest of the guide it demonstrates multiple levels of on-the-job support. A flowchart like this represents a series of decisions. You could represent the same information in a table. One argument against using a single table is that there are multiple conditions here, and each condition would be an additional column in a decision table. A decision table with five columns (four for conditions, one for the actions) gets wide and thus unwieldy. You can get around that by creating multiple tables. For Cisco’s intended audience, though, the flowchart format probably works well. They’re presumably skilled technicians, accustomed to the flow of such diagrams. The flowchart is concise to the point of terseness. You can’t use this job aid if you don’t know what a PEM is or what the ICC+ status is — but if that’s the case, you probably shouldn’t be messing around with the uBR10012 router, which can provide broadband for up to 64,000 subscribers. Is the PEM Power OK LED on? If not, troubleshoot the PEM. When that’s done, see if the PEM Power OK LED is on now. If not, see the section (chapter) on PEM faults. Sounds obvious, but one point of a job aid is to reduce the need for memorization. Follow these steps, and you’ll cover everything you should cover. Another point, perhaps less obvious, is that a technical job aid aims to overcome tunnel vision. Notice the four round-corner boxes running down the center: Sometimes you reseat a device; sometimes you reseat and restart. I have no idea why, but I’m pretty sure there’s a difference that matters. In the process of troubleshooting, the technical who follows the guide doesn’t waste time restarting when that’s not required. Despite a lack of visual appeal, the flowchart and the guide it comes from represent an effective way to guide troubleshooting performance. The flowchart itself is a summary aimed at a performer who understands its laconic style. It’s a memory jogger. 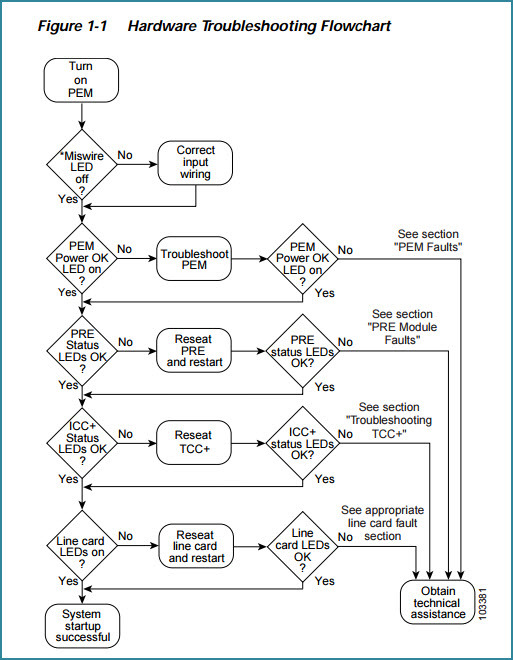 But: if the PRE status LED won’t come on, the flowchart send you to chapter 3, with its 19 pages of PRE-specific troubleshooting. Those pages include what I call procedures (sets of numbered steps, like the one for resolving console port connection problems); mini-procedures (short sets, with bullets instead of numbers); decision tables (“fault indications and recommended actions”); and different types of references (like a diagram of the PRE-1 faceplate and its indicator lights). In other words, the Cisco uBR10012 Universal Broadband Router Troubleshooting Guide is at one level a single job aid (the job: troubleshooting the router), and at another level a collection of dozens of specialized job aids. None of this fit-it-all-onto-one-laminated-sheet silliness: if you need two pages to guide a technician through TCC+ card faults, that’s what you use.